What are swirl flaps and should you be worried about them? Here at TWG Automotive, one of Surrey’s leading Independent Specialists in BMW and MINI Vehicles, we think you should read on and see what you think. Swirl flaps are fitted to BMW diesel engines from 2000. 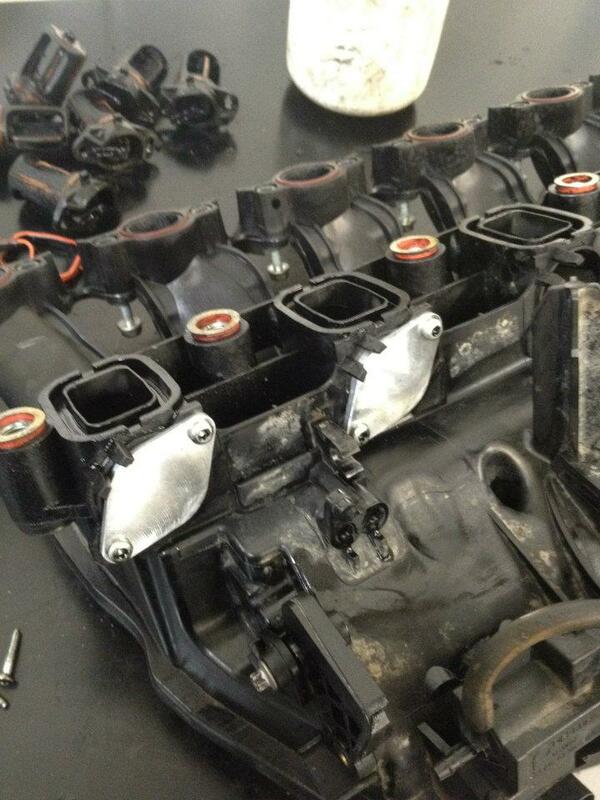 They are built inside your intake manifold and act as a valve which by opening or closing will affect the length of the intake manifold by lengthening or shortening the route the air travels inside it. This has the benefit of altering the torque output of the engine but mainly reducing the engine’s emissions at idle. In normal driving the swirl flaps are open, the shortest route, so by removing the complete flap there is little to no performance difference felt when driving the vehicle. The swirl flap is a rectangle piece of metal that acts as the valve (later changed to plastic) that fits inside a sleeve and is held in place by two small screws. The danger is that the screws that hold in place the rectangle valve over time can work themselves loose and fall out, this results in the swirl flap and bolts passing through your engine and potentially creating massive damage to your cylinder head, piston, engine block and turbo. In 2006 BMW modified the swirl flaps and this should stop the risk of the swirl flap and bolts falling into the engine as the flaps are now plastic and the bolts have been removed. The solution for this problem is to fit some swirl flap blanking plugs, which means the entire swirl flap system can be removed and all the risk of failure. The only drawbacks to this solution is slightly increased emissions on idle and at very low speeds, there should be little to no performance loss or fuel economy loss. The engines affected by this are the M57, M47TU and the M57TU, these engines are fitted to the E46 320d, 330d, E39 530d and the E60/E61 525d, 530d,535d the E83 X3 2.0d, 3.0d the E53 X5 3.0d and the E65 730d. If you are not sure if your car is affected then please call and we can let you know, as a rule of thumb if you have a BMW diesel from 2000 and it has an automatic gearbox then chances are it has swirl flaps fitted.